The election of 1856 was hotly contested throughout the North, with state after state switching from Democratic control to that of the new found Republican party. The Democrat incumbent Governor of Wisconsin, William A Barstow was initially declared the winner of the contest by a mere 157 votes. The Republicans cried fraud. Democrats and Republicans formed rival militia units and began to converge on Madison, determined to fight if the “wrong” candidate were sworn in as governor. 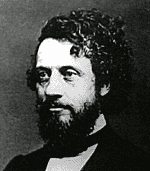 Both Barstow, and his Republican rival, Coles Bashford, were sworn in as governor in dueling inauguration ceremonies on January 7, 1857. Civil War seemed all but certain.